Medium Voltage, XLPE Insulated, PVC Outer Sheathed Aerial Bundled Cable. 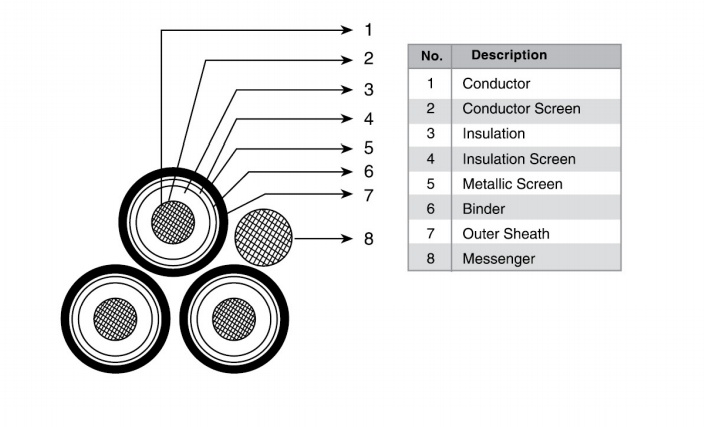 Circular compacted stranded aluminum conductor, XLPE insulated, copper tape screened and PVC outer sheathed cable. The three XLPE insulated and copper tape screened single core cables are bundled around the galvanized steel wires in a right hand lay. 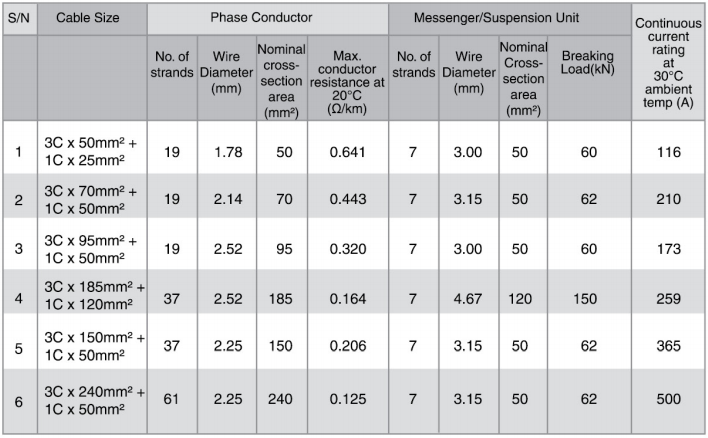 Phase conductors are circular compacted stranded aluminum. The standard messenger comprises of stranded galvanized steel wires. Extruded layer of semi conductive compound. Cross-linked polyethylene (XLPE) rated at 90℃. Red, yellow and blue tapes shall be applied between nonmetallic and metallic part of insulation screen. The outer sheath shall be embossed with figures 1, 2, 3 corresponding to red, yellow, blue phase. PVC type ST2 to IEC 60502 color black. The three XLPE insulated and copper tape screened single core cables are bundled around the galvanized steel messenger wires in a right hand lay.